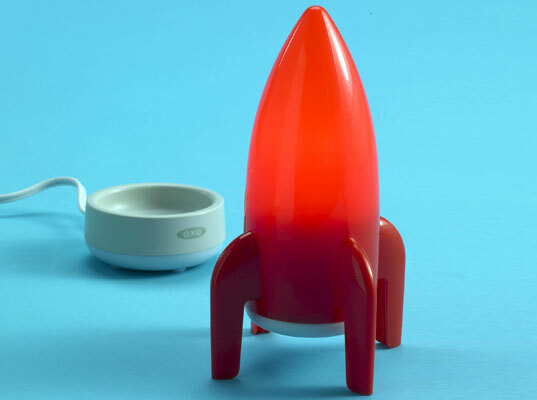 What better way to send your favorite astronaut-in-training blasting off to Dreamland than with a rocket-shaped nightlight? This bright red spacecraft by OXO includes an LED bulb that never requires changing. You don’t have to keep your nightlight tethered to its charging base, either. Because the rocket stays lit for up to eight hours per charge, the rechargeable battery only needs the occasional boost. To infinity and beyond! What better way to send your favorite astronaut-in-training blasting off to Dreamland than with a rocket-shaped nightlight? This bright red spacecraft by OXO includes an LED bulb that never requires changing. You don't have to keep your nightlight tethered to its charging base, either. Because the rocket stays lit for up to eight hours per charge, the rechargeable battery only needs the occasional boost. To infinity and beyond!